​​Newcastle grew into the first half and created the better chances. The equaliser eventually came from a Matt Ritchie corner kick, Ciaran Clark getting away from his marker and expertly finding the bottom left hand corner with a fantastic header to get the Magpies level. ​​Chelsea dominated the first half with the ball but failed to create chances. ​The game slowly fizzled out as time drew on, both sides failing to make any clear cut chances towards the end of the second half. Chelsea remain in the top four with the three points, while Newcastle drop into the relegation zone on the back of that defeat - and Cardiff's draw earlier in the day. Hazard failed to make a great deal of impact in a false nine role, and Chelsea’s chances were limited throughout the game. Both wingers got on the scoresheet with good individual efforts, but failed to link up effectively with the Belgian. The January transfer window will play a vital part of Chelsea’s season, with Saturday's game showing once again how much the Blues miss having a true striker as a focal point. ​Starting XI: Arrizabalaga (6), Azpilicueta (7), Rüdiger (5), Luiz (8*), Alonso (7), Jorginho (5), Kanté (6), Kovacic (6), Willian (8), Pedro (7), Hazard (6). ​Substitutes: Barkley (6), Hudson Odoi (6), Giroud (N/A). ​​David Luiz played a big part in Chelsea’s win. In a team which lacked that bit of quality throughout the game, the Brazilian strolled through. 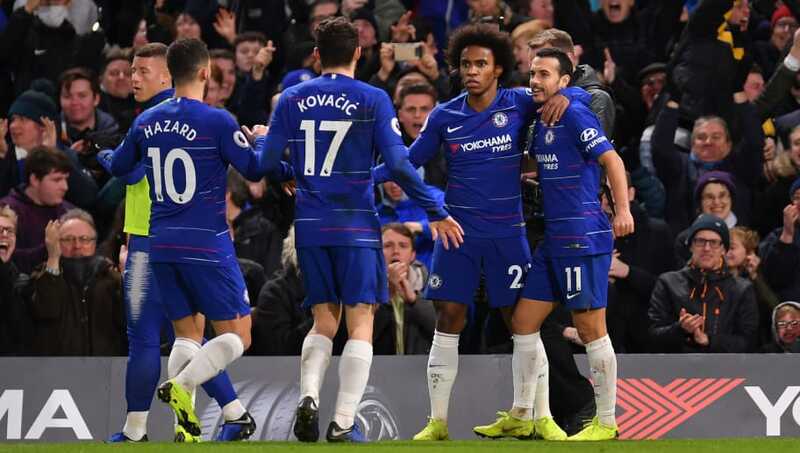 The defender played a terrific through ball to Pedro that led to Chelsea’s opening goal and, while Newcastle had plenty of chances, Luiz helped out defensive partner Rüdiger on several occasions to keep the Blues in charge. ​While Eden Hazard failed to make any impact throughout the game, Jorginho lived up only to recent criticism of his performances. The Italian looked uncomfortable on the ball and struggled throughout the game. He signed from ​Napoli with big reputation, but the midfielder gave the ball away on a number of occasions and a few mis-hit passes headed off the pitch. ​The Magpies created lots of chances in the wide areas but failed to make them count. Christian Atsu and Ayoze Perez made good runs and created more chances than Chelsea in the first half, but did not take advantage of this while they were on the front foot. The team saw little of the ball but managed to create nine attempts on goal - a lack of quality seeing only two of them hit the target. ​Starting XI: Dubravka (6), Yedlin (6), Clark (7), Lascelles (6), Lejeune (6), Ritchie (5), Perez (7), Longstaff (6), Hayden (6), Atsu (8), Rondon (8*). ​Substitutes: Murphy (6), Manquillo (5). ​Salomon Rondon led the line well and worked tirelessly for the full 90 minutes. He linked up well with Perez and Atsu as Newcastle created many chances in the first half and, while his effort level dropped as Newcastle saw less of the ball, he was at the heart of all of the Magpies' attacking play.